Katie Morag herself lives – above the family shop, by the island pier - on the fictitious Isle of Struay and in a village closely modeled on Coll’s main community of Arinagour. Her mother is the local postmistress; her Dad runs the store and her jolly, dungaree-clad, tractor-driving ‘Granny Island’ is another central character. ‘Grannie Mainland’ is a much more proper personality – though far less fun – and, in the day we’re in, the unconventional Grannie Island has naturally been hailed as "a positive image, a celebration of the strength of women, and a challenge to gender stereotyping…" – which hasn’t done sales of the books any harm. The perky little girl made her debut in Katie Morag Delivers the Mail (1984) and to date fourteen stories have appeared, as well as several omnibus volumes. For many years there was talk of adapting the tales for television – the character was first optioned by Scots filmmaker Don Coutts in 1997 – and, by 2005, there was the first talk of filming such a series on Lewis. In November 2012 it was announced at last that the BBC CBeebies channel had commissioned twenty-six 14-minute live-action dramas, from Coutts’s Cromarty-based production company Move On Up. Casting took place in Stornoway in March 2013, with wee Cherry Campbell securing the starring role – and, after much scouting for locals, Tolsta Chaolais, just down the road from Glenview, was chosen as the perfect and archetypal Hebridean village for the shooting. Filming was done between May and August 2013 and an additional Gaelic-language soundtrack was recorded for future broadcast on BBC Alba. 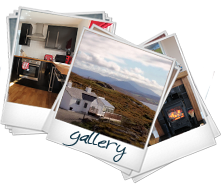 Fantastic holiday cottage, extremely well equipped and furnished to a very high standard.